Each year, a number of children and adolescents die suddenly from cardiac problems that are associated with a small subgroup of disorders and high-risk behaviors. While sudden cardiac death in any child or adolescent is distressing, it can be particularly devastating when it occurs in a seemingly healthy young athlete. Although uncommon in competitive sports, sudden death is a catastrophe that physicians who care for athletes should attempt to prevent. To prevent the occurrence of sudden death or cardiovascular disease progression in young athletes, the American Academy of Family Physicians, American Academy of Pediatrics, American College of Cardiology, American College of Sports Medicine, American Heart Association, American Medical Society for Sports Medicine, American Orthopaedic Society for Sports Medicine and American Osteopathic Academy of Sports Medicine have developed or endorsed recommendations for cardiovascular screening of student athletes as part of a comprehensive sports preparticipation physical evaluation (PPE). Knowledge and understanding of these recommendations can help physicians make informed decisions about the eligibility of an athlete to participate in a particular sport and encourage development of a more uniform PPE screening process. The low yield of clinically significant cardiac abnormalities from screening has generated debate about the usefulness of the cardiac portion of the sports preparticipation physical evaluation (PPE).3,6,12–17 The practicality and utility of screening are limited by the low prevalence of relevant cardiovascular lesions in the general youth population, the low risk of sudden death even among persons with an unsuspected abnormality and the large size of the competitive athletic population (approximately 8 million high school and college sports participants each year).3,13 It is estimated that 200,000 children and adolescents would have to be screened to detect 1,000 athletes who are at risk for sudden death and one person who would actually die.14 Despite their rare occurrence, underlying cardiac anomalies in young athletes are emphasized because of the potential they pose for causing cardiovascular collapse during competition. Currently, there is no cost-effective battery of tests to identify all, or even most, of the dangerous cardiovascular conditions.3,12,14 Various screening methods for sudden cardiac death have been investigated, including history and physical examination alone or coupled with screening echocardiography and electrocardiography, but no clear-cut cost-effective method has emerged. A national standard is needed for preparticipation medical evaluations, including cardiovascular screening, because of heterogeneity in the design and content of preparticipation screening among states. Some form of cardiovascular preparticipation screening is justifiable and compelling for all high school and college athletes, based on ethical, legal and medical grounds. Cardiovascular preparticipation screening, including a history and physical examination, should be mandatory for all athletes and should be performed before participation in organized high school (grades nine through 12) and college sports. A complete and careful personal and family history and physical examination designed to identify (or raise suspicion of) those cardiovascular lesions known to cause sudden death or disease progression in young athletes is the best available and most practical approach to screening populations of competitive sports participants, regardless of age. The examination is to be performed by a health care worker (preferably a physician) who has the requisite training, medical skills and background to reliably obtain a detailed cardiovascular history, perform a physical examination and recognize heart disease. For high school athletes, screening must occur every two years, with an interim history in intervening years. Reprinted with permission from Maron BJ, Thompson PD, Puffer JC, McGrew CA, Strong WB, Douglas PS, et al. Cardiovascular preparticipation screening of competitive athletes. A statement for health professionals from the Sudden Death Committee and Congenital Cardiac Defects Committee, American Heart Association Circulation 1996;94:850-6 [Addendum published in Circulation 1998;97:2294]. Perform precordial auscultation in supine and standing positions to identify, in particular, heart murmurs consistent with dynamic left ventricular outflow obstruction. Assess femoral artery pulses to exclude coarctation of the aorta. Recognize physical stigmata of Marfan syndrome. Assess brachial artery blood pressure in the sitting position. Adapted with permission from Maron BJ, Thompson PD, Puffer JC, McGrew CA, Strong WB, Douglas PS, et al. Cardiovascular preparticipation screening of competitive athletes. A statement for health professionals from the Sudden Death Committee and Congenital Cardiac Defects Committee, American Heart Association. Circulation 1996;94:850-6 [Addendum published in Circulation 1998; 97:2294]. A complete, careful personal and family history and physical examination are recommended to identify or raise suspicion of cardiovascular lesions known to cause sudden cardiac death or disease progression in young athletes. The cardiac history focuses on questions that screen for congenital heart disease and symptoms that suggest an underlying cardiac problem. When cardiovascular abnormalities are identified or suspected, the athlete should be referred to a specialist for further evaluation or confirmation. Despite a lack of compelling evidence to show that cardiovascular PPE screening is effective, it is recommended based on cost and medicolegal considerations. While this method may be imperfect, the AHA panel considered it the most practical and best available strategy for screening large populations of athletes. Noninvasive testing (e.g., echocardiography and electrocardiography [ECG]) can enhance the diagnostic power of the standard history and physical examination, but it is not recommended for cardiovascular PPE screening. Comprehensive and expensive screening tests have not proved to be cost-effective, nor can they consistently identify athletes at risk. This considers the large number of competitive athletes in the United States, the relatively low frequency of cardiovascular lesions responsible for these deaths and the low rate of sudden cardiac death in young athletes. The widespread use of non-invasive testing in athletic populations is impractical and could result in many false-positive test results, with the likelihood that the number of false-positive results would greatly exceed the number of true-positive results. Detect medical or musculoskeletal conditions that may predispose to injury or illness during competition. Detect potentially life-threatening or disabling medical or musculoskeletal conditions that may limit an athlete's safe participation in sports. Meet legal and insurance requirements. Determine the general health of the athlete. Counsel and educate athletes on health-related issues (e.g., use of tobacco, alcohol and other drugs, unhealthy sexual practices and psychosocial issues). Assess fitness levels for specific sports. Reprinted with permission from Smith DM, American Academy of Family Physicians, Preparticipation Physical Evaluation Task Force. Preparticipation physical evaluation. 2d ed. Minneapolis: Physician and Sportsmedicine, 1997. In 1997, the Preparticipation Physical Evaluation Task Force,12 composed of members of the American Academy of Family Physicians (AAFP), American Academy of Pediatrics (AAP), American Medical Society for Sports Medicine, American Orthopaedic Society for Sports Medicine and American Osteopathic Academy of Sports Medicine released the second edition of a guide for physicians who perform PPEs. The monograph covers the goals of the PPE, gives detailed instructions on how to obtain a preparticipation history and perform a physical examination, and information on determining clearance for participation, and discusses medicolegal precautions. It establishes the minimum content for PPEs and provides an outline for primary care physicians regarding appropriate steps in the PPE. No optimal method of delivery of PPEs is endorsed. If the athlete's history and physical examination findings raise suspicion, further diagnostic work-up is recommended, including echocardiography, ECG or exercise stress testing. Like the AHA panel,3 the PPE Task Force determined that routine use of such procedures in preparticipation screening is not cost-effective. The monograph includes a “Preparticipation Physical Evaluation” form (Figure 1) that physicians can copy and use for each examination. Three items recommended by the AHA are not included on this form (i.e., family history of heart disease, a specific item for recognition of a heart murmur in the physical examination and a specific item for recognition of the physical stigmata of Marfan syndrome).19 While these discrepancies may be considered by the PPE Task Force in the future, use of the current PPE form can help ensure that examining physicians consider the following components of the cardiac evaluation recommended by the PPE Task Force. Preparticipation Physical Evaluation (PPE) form can be copied and used for each examination of student athletes. Using this form can help ensure that examining physicians consider the components of the cardiac evaluation recommended by the PPE Task Force. Adapted with permission from Smith DM, American Academy of Family Physicians, Preparticipation Physical Evaluation Task Force. Preparticipation physical evaluation. 2d ed. Minneapolis: Physician Sportsmedicine, 1997. It is unlikely that many young athletes who experience chest pain, syncope, exercise intolerance or palpitations, or who have a clinically significant family history will reveal such information unless specifically asked. The medical history is therefore a critical aspect of the cardiac evaluation. Careful attention to the cardiac history is warranted because several of the conditions known to cause sudden cardiac death (e.g., arrhythmias, premature coronary artery disease and aberrant coronary arteries) have no auscultatory findings. If possible, the student athlete and a parent should complete the history form together before the physical examination. Dizziness, lightheadedness or syncope during or after exercise may indicate underlying hypertrophic cardiomyopathy, conduction abnormalities, arrhythmias or valvular problems such as aortic stenosis and mitral valve prolapse. Chest pains during or after exercise may indicate a coronary artery anomaly or advanced cardiovascular disease. Dyspnea that is out of proportion to activity may indicate structural abnormalities, valve problems or underlying lung disease. Palpitations during or after exercise may signal arrhythmias or conduction abnormalities. A history of high blood pressure, high cholesterol levels, recent viral illness (e.g., myocarditis, mononucleosis) or prior restriction from participation in sports for cardiovascular reasons warrant further investigation. A history of heart murmur merits concern, although a benign murmur may be detected on examination of many athletes. Relevant history should include recent legal and illegal drug use (including alcohol and tobacco), eating disorders, history of congenital heart disease or previous cardiac surgery. A family history of sudden death before age 50 is extremely important, as some causes of death can be familial (premature coronary artery disease, Marfan syndrome and hypertrophic cardiomyopathy). Any history that suggests a risk for congenital heart disease should stimulate more in-depth cardiac evaluation. A complete physical examination is not indicated in a sports PPE. Screening is generally limited to physical examination of the cardiovascular and musculoskeletal systems, eyes, oral cavity, ears, nose, lungs, abdomen, genitalia (males) and skin. Anthropometric measurement includes height, weight and blood pressure. Cardiovascular examination should include resting blood pressure, palpation of radial and femoral pulses and auscultation of the heart. Auscultation of the Heart. Auscultation of the heart should be performed with the patient in standing and supine positions to detect murmurs and dysrhythmias. Murmurs in adolescents are common, and various maneuvers can be performed to help differentiate functional from pathologic murmurs. Murmurs should be evaluated on the basis of intensity, loudness, location and timing during the cycle. Any systolic murmur grade 3/6 or higher, any diastolic murmur and any murmur that gets louder with the Valsalva maneuver should be evaluated further before the athlete is cleared for participation. Attention should also be given to the presence of clicks and extra heart sounds. If the physician is in doubt regarding the cause of any murmur, the athlete should be referred to a cardiologist for further evaluation, and clearance should be deferred pending results of that examination. Detected arrhythmias also may require further cardiac evaluation. Blood Pressure and Pulses. In children and adolescents, blood pressure should be compared to age-adjusted tables. 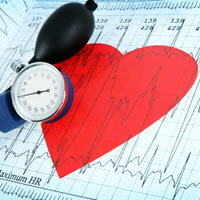 If the blood pressure remains elevated above the age-related criteria for hypertension after a 10- to 15-minute rest period, the athlete should be questioned about the use of caffeine, nicotine or even over-the-counter stimulants such as ephedrine, and referred to his or her own personal physician for evaluation before clearance. Peripheral pulses (radial and femoral) also should be measured for rate and rhythm and to rule out coarctation of the aorta. Any restriction to activity should be fully explained to the athlete, parents, coaching staff and other school personnel.12 If an athlete has not been cleared for a particular sport, the physician needs to act as the athlete's advocate and advise the athlete, family and athletic staff regarding the risk of participation. Physicians who perform PPEs should inform athletes and their parents of the limitations of cardiovascular screening and the small risks that may remain despite normal findings in the screening examination. Should the athlete and parents risk participation, it is generally necessary for them to sign a legal document stating that they understand the potential risk of participation to the athlete, although such documents are not always legally binding. If the athlete's condition is thought to be too great a risk to the person or a danger to the health of other participants, the athlete still may be excluded from participation. A survey of 879 National Collegiate Athletic Association colleges and universities found that PPE screening was required by 855 schools (97 percent) and was required annually by 446 schools (51 percent).24 Analysis of PPE forms from 625 of these schools revealed that 163 (26 percent) incorporated most of the 1996 AHA recommendations for cardiovascular PPE screening. Cardiovascular PPE screening poses problems because potentially fatal abnormalities are uncommon and in some cases undetectable without sophisticated tests. Most sudden cardiac deaths in athletes are caused by anomalies that are clinically silent, rare or difficult to detect by history and physical examination. Many athletes may not experience symptoms consistent with heart disease or may not report family histories of sudden cardiac death. Important clues to a cardiac abnormality include history of syncope, chest pain and family history of sudden death. Any underlying condition suspected on the basis of history or physical examination requires further diagnostic evaluation before the athlete can be cleared for activity. Because of variability and inconsistency among state requirements for PPEs, adoption of a more uniform PPE screening process must be encouraged to close the gap between screening practices recommended by sports medicine experts and actual practice. Training or accreditation of PPE examiners also should be considered. While the extent of screening continues to be debated, clinical guidelines for performing PPEs and determining clearance have been established. For cardiovascular screening, a focused personal and family history and physical examination are recommended by the AHA and seven other medical organizations as the best available methods of identifying risk factors for sudden death in young athletes. Without standardized methods for screening athletes for occult and possibly lethal heart disease, it is not possible to assess the value of a focused history and physical examination in detecting and preventing cardiovascular death. Future advances in the diagnosis, treatment and understanding of cardiovascular disease will likely provide better tools for preventing sudden death in young athletes. Physicians should be alert to the emerging role of genetic testing for cardiovascular diseases in athletes with a family history of heart disease or sudden cardiac death (e.g., hypertrophic cardiomyopathy, long QT syndrome) or a known genetic disorder in which cardiac problems may be a component (Marfan syndrome). Currently, genetic screening (i.e., for hypertrophic cardiomyopathy) is not practical or feasible in large populations.3,25 As this technology becomes more available, the medical, ethical and legal implications of genetic testing of athletes will require careful deliberation. JAMES M. LYZNICKI, M.S., M.P.H., is a senior scientist in the American Medical Association (AMA) Group on Science, Technology, and Public Health, and assistant secretary to the AMA Council on Scientific Affairs. He received a master of science degree at the University of Minnesota at Minneapolis and a master of public health degree at the University of Illinois at Chicago School of Public Health. NANCY H. NIELSEN, M.D., PH.D., serves as clinical faculty at the State University of New York at Buffalo School of Medicine and Biomedical Sciences. She earned a medical degree from State University of New York at Buffalo School of Medicine and Biomedical Sciences, where she served a residency in internal medicine. She earned a doctoral degree in microbiology from Catholic University of America, Washington, D.C.
JOHN F. SCHNEIDER, M.D., PH.D., is in practice at the University of Chicago Hospitals and professor of clinical medicine in the Division of Biological Sciences at the University of Chicago Pritzker School of Medicine. He earned a medical degree and a doctoral degree in biochemistry from the University of Chicago Pritzker School of Medicine. Address correspondence to Barry Dickinson, Ph.D., Secretary to the Council on Scientific Affairs, American Medical Association, 515 N. State St., Chicago, IL 60610. E-mail address: barry_dickinson@ama-assn.org. Reprints are not available from the authors. Members and staff of the Council on Scientific Affairs at the time this report was prepared include the following: Myron Genel, M.D. ; Michael A. Williams, M.D. ; Roy D. Altman, M.D. ; Scott D. Deitchman, M.D., M.P.H. ; J. Chris Hawk III, M.D. ; John P. Howe III, M.D. ; Hillary D. Johnson; Nancy H. Nielsen, M.D., Ph.D., John F. Schneider, M.D., Ph.D.; Melvyn L. Sterling, M.D. ; Zoltan Trizna, M.D., Ph.D.; and Donald C. Young, M.D. Staff: Barry D. Dickinson, Ph.D.; James M. Lyznicki, M.S., M.P.H. ; and Marsha Meyer. 1. Maron BJ, Epstein SE, Roberts WC. Causes of sudden death in competitive athletes. J Am Coll Cardiol. 1986;7:204–14. 2. Maron BJ, Gohman TE, Aeppli D. Prevalence of sudden cardiac death during competitive sports activities in Minnesota high school athletes. J Am Coll Cardiol. 1998;32:1881–4. 4. Van Camp SP, Bloor CM, Mueller FO, Cantu RC, Olson HG. Nontraumatic sports death in high school and college athletes. Med Sci Sports Exerc. 1995;25:641–7. 5. Liberthson RR. Sudden death from cardiac causes in children and young adults. N Engl J Med. 1996;334:1039–44. 6. Maron BJ, Shirani J, Poliac LC, Mathenge R, Roberts WC, Mueller FO. Sudden cardiac death in young competitive athletes. Clinical, demographic, and pathological profiles. JAMA. 1996;276:199–204. 7. Williams, RA, ed. The athlete and heart disease: diagnosis, evaluation and management. Philadelphia: Lippincott Williams & Wilkins, 1999. 8. Basilico FC. Cardiovascular disease in athletes. Am J Sports Med. 1999;27:108–21. 9. Futterman LG, Myerburg R. Sudden death in athletes: an update. Sports Med. 1998;26:335–50. 10. Luckstead EF. Cardiovascular evaluation of the young athlete. Adolesc Med. 1998;9:441–55. 11. Franklin BA, Fletcher GF, Gordon NF, Noakes TD, Ades PA, Balady GJ. Cardiovascular evaluation of the athlete. Issues regarding performance, screening and sudden cardiac death. Sports Med. 1997;24:97–119. 12. Smith DM, American Academy of Family Physicians, Preparticipation Physical Evaluation Task Force. Preparticipation physical evaluation. 2d ed. Minneapolis: Physician and Sportsmedicine, 1997. 13. Group on Science and Technology, American Medical Association. Athletic preparticipation examinations for adolescents. Report of the Board of Trustees. Arch Pediatr Adolesc Med. 1994;148:93–8. 14. Epstein SE, Maron BJ. Sudden death and the competitive athlete: perspectives on preparticipation screening studies. J Am Coll Cardiol. 1986;7:220–30. 15. Smith J, Laskowski ER. The preparticipation physical examination: Mayo Clinic experience with 2,739 examinations. Mayo Clin Proc. 1998;73:419–29. 16. Fuller CM, McNulty CM, Spring DA, Arger KM, Bruce SS, Chryssos BE, et al. Prospective screening of 5,615 high school athletes for risk of sudden cardiac death. Med Sci Sports Exerc. 1997;29:1131–8. 17. MacAuley D. Does the preseason screening for cardiac disease really work? The British perspective. Med Sci Sports Exerc. 1998;30:S345–50. 18. Council on Scientific Affairs, American Medical Association. Ensuring the health of the adolescent athlete. Arch Fam Med. 1993;2:446–8. 19. Maron BJ. Comprehensive cardiac PPE [Reply to letter]. Phys Sportsmed. 1999;27:12,118. 20. Maron BJ, Mitchell JH. 26th Bethesda Conference: recommendations for determining eligibility for competition in athletes with cardiovascular abnormalities. J Am Coll Cardiol. 1994;24:845–99. 21. Committee on Sports Medicine and Fitness, American Academy of Pediatrics. Medical conditions affecting sports participation. Pediatrics. 1994;94:757–60. 22. Glover DW, Maron BJ. Profile of preparticipation cardiovascular screening for high school athletes. JAMA. 1998;279:1817–9. 23. Gomez JE, Lantry BR, Saathoff KN. Current use of adequate preparticipation history forms for heart disease screening of high school athletes. Arch Pediatr Adolesc Med. 1999;153:723–6. 24. Pfister GC, Puffer JC, Maron BJ. Preparticipation cardiovascular screening for U.S. collegiate student-athletes. JAMA. 2000;283:1597–9. 25. Maron BJ, Moller JH, Seidman CE, Vincent GM, Dietz HC, Moss AJ, et al. Impact of laboratory molecular diagnosis on contemporary diagnostic criteria for genetically transmitted cardiovascular diseases: hypertrophic cardiomyopathy, long-QT syndrome, and Marfan syndrome. Circulation. 1998;98:1460–71. The original version of this article was presented as Report 5 of the Council on Scientific Affairs at the 1999 American Medical Association (AMA) Interim Meeting. Recommendations were adopted at that meeting as AMA policy. See accompanying editorial for recommendations.